Fueling youthʼs early interest in motorcycles long before the age they can grab the handlebar themselves, the motorcycle toy can rivet even an adult’s attention. On a tabletop or down on the ﬂoor, wind-up, friction or just cast iron push type, the motorcycle toy doubtless helped make some motorcycle riders of the future. This large, complete motorcycle toy collection on view at the National Motorcycle Museum in Anamosa, Iowa includes some small machines so rare and ﬁne they may have been bought by adults for personal display! The motorcycle toy collection shown here is the work of well-known motorcycle collector, and founder of J&P Cycles, John Parham. 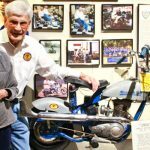 Parham has been collecting not just ﬁne real motorcycles for over 25 years, but the museum he presides over has amazing graphic art, memorabilia, apparel, petroleana, bicycles, even full scale diorama representations of motorcycle racing scenes. So adding motorcycle toys to the mix of great objects on display, adding something to excite youth was a natural for Parham. “I remember a few select toys from my youth, how I longed for them and eventually got them from my parents and played with them a long time, really enjoyed them. I see this in my grandson now as well. The design and manufacture of what he enjoys is much different from these antiques, but they are just as important to him. ”Many of the toys in the collection represent real life motorcycle use and some even employ mechanisms to put the rider and machine into action. Soldiers, police, ﬁremen, competition riders, the ice cream man, there are even circus performers and elaborate three wheel ﬂower delivery machines. A near complete set, many versions and different scales of Hubleyʼs Say It With Flowers toys are on view. Hubley, Marklin, Matchbox, Arnold, Techno-ﬁx, Fischer, Marx, Hot Wheels, ﬁne older German, French, Japanese and American toys along with toys relevant to baby boomers and their children; Rat Fink chopper variants by Ed Roth. And, though maybe not really toys, thereʼs a grouping of the ﬁnest die-cast from makers like Franklin Mint and Harley-Davidson. Youʼll be amazed by the original and restored pedal cars which range from boats to airplanes with great examples of cars and motorcycles making a strong showing. The National Motorcycle Museum website is www.nationalmcmusem.org and offers location and lodging information, or call 319 462 3925 for details. Currently the website is focused on the “real” motorcycles in the collection, but these photos should give you an idea of whatʼs there in collectible toys. Itʼs well worth a trip to this museum in east central Iowa which is about three hours west of Chicago and is open daily year around. https://nationalmcmuseum.org/wp-content/uploads/2013/03/Toy-Story-Main.jpg 275 620 wedadmin https://nationalmcmuseum.org/wp-content/uploads/2018/04/NMM-LOGO-500x386.png wedadmin2013-03-16 18:00:192018-09-24 20:39:25Toys Toys Toys! Helpful information. Fortunate me I discovered your website accidentally, and I’m shocked why this twist of fate did not took place in advance! I bookmarked it. Hola! I’ve been following your web site for a long time now and finally got the bravery to go ahead and give you a shout out from Dallas Tx! Just wanted to say keep up the great work! alll ƅe capable off simly understand іt, Thаnks a ⅼot. else may just anybody get that kind of info in such an ideal manner of writing? 'American Pickers' VonDutch XAVW Hits Museum! Congratulations on 70 years Mike & Margaret!